Would you like to help develop extraordinary players in your soccer coaching? This guide to soccer player development for coaches of young athletes ages 7 to 14 will help direct you. Players 1st is as unconventional as it is comprehensive. It takes the longer-term view that if you teach the skills, the kids will play for a lifetime. Player’s 1st emphasizes developing the player, meaning the focus is individual improvement rather than the team result. Soccer Alive: The Game is the Best Teacher Soccer teaches players and coaches to think while on the field of play to improve strategy and technique. Soccer Analytics: Successful Coaching through Match Analysis applies research findings from soccer match analysis, coaching analysis, decision making in sport and motor skill acquisition to inform the coach on best practices, with a view to improving performance of the individual player and the team. Soccer coaches need to train passing, dribbling, shooting tactics and much more. It is not easy for them to find the best exercises to make and build a good team. That is where Soccer: The 6-Week Plan comes in. There is a former professional soccer player from Germany, Toto Schmugge. He has created the perfect 6-week plan that will help coaches of any skill and experience level give their team a competitive edge and gain confidence as a coach. This plan is adjusted to especially help during pre-season training. 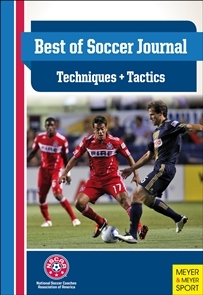 The 4-4-2 System – Endorsed by the NSCAA – covers everything a coach needs to know about how to coach soccer’s 4-4-2 system successfully.